Craving the cookout of the summer? The kind where you can enjoy unlimited burgers and Budweiser beers while taking in stunning views of the Manhattan skyline? Look no further than this year’s Battle of the Burger, folks. On Thursday, August 16 at LIC Landing, a brand-new, 2,000-square-foot joint along the Long Island City waterfront, you can take your pick between two evening sessions: 5:30–7:30pm or 8–10pm. While you’re eating your way through the most mouthwatering creations in town, you can also play lawn games or get down to a live DJ. Of course, there’s also the voting—this is a battle, after all. At the end of the night, we’ll tally attendees’ votes for the fairest burger of them all and crown the People’s Choice winner, who will receive bragging rights and claim the throne from last year’s victor, the Cannibal Liquor House. Grab a ticket now. It’s going to be one hell of a patty. 5 Napkin Burger from 5 Napkin Burger: This one packs a punch of indulgent French flavors, with imported Gruyère, caramelized onions and rosemary-garlic aioli. Short-Rib Bulgogi Bacon Cheeseburger from BarKogi: This ain’t your average burger: A coarsely ground short-rib patty is hit with bulgogi sauce, pepper-jack cheese, applewood-smoked bacon, roasted tomato, butter lettuce, red onion, garlic ketchup, Kewpie mayo and kimchi, all on a brioche bun. 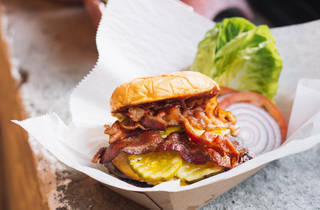 Dry-Aged Burger from Eats on Lex: A patty of perfect beef takes center stage, with unfussy toppings of caramelized onions and American cheese on a seedless bun. Hot Mess Burger from Harlem Shake: A Pat LaFrieda beef patty is smothered with American cheese, onions, pickles, bacon relish, pickled cherry peppers and chipotle mayo for a smoky beauty with some serious heat. Pop Pop’s Top-Shelf Cheeseburger from Peter McManus Café: The no-frills dive bar has one classy burger, a blend of brisket, short ribs and chuck that has all the tried-and-true accoutrements: aged cheddar, onions, pickles and “fancy” sauce on a brioche bun. 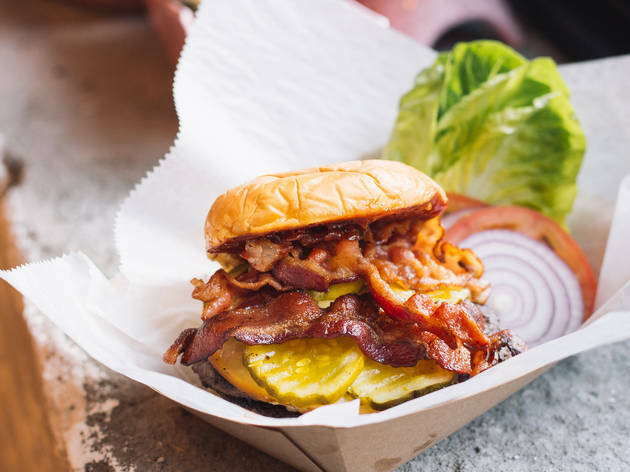 Spicy Smokehouse Burger from Genuine Roadside: This burger brings the spice with a charred jalapeno mayo, chipotle BBQ sauce, smoked Gouda, crispy bacon and sweet pickle slices. Strip House Slider from Strip House: You're going to want to throw back a few of these beef sliders with cheddar cheese, Russian dressing, pickled jalapeños, and fried shallots. Bacon BBQ Blue Burger from PJ Clarke's: American cheese gets swapped out for a powerful buttermilk blue cheese in this beauty topped also with smoked bacon, barbecue sauce and crispy shallots. Trixie Burger from The Baroness Bar & Kitchen: A brisket and short rib blend is seasoned with a 13-spice blend and stuffed with creamy goat cheese before getting hit with a honey-molasses glaze, pepper slaw and rosemary-garlic aioli, all on a potato roll. Chopped Cheese from The Dram Shop: A true classic beauty, this patty is crowned with American cheese, lettuce, tomato, grilled onions, pickled jalapeños, mayo and mustard.